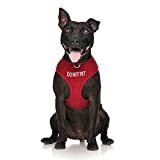 Pet Toys, Pet Leashes, Dog Harnesses, Swim Vests and other Pet Accessories. 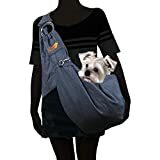 Living World Carrier is the perfect solution for carrying your precious small pet safely and easily. The unit has many innovative design features for comfort and convenience. Made of durable, chew-resistant plastic, the carrier is built to last. It has twin handles for enhanced carrying comfort and a large opening at the top for easy inside access. A network of ventilation slits all around the carrier is designed for optimal air circulation. The carrier has a ridged bottom surface that provides your pet with secure footing as you carry the unit. It also has a locking system to ensure your pet will not escape. The carrier is also ideal for use as a temporary home during cage cleanings. 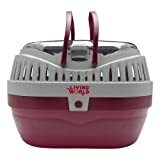 This Large Carrier is suitable for rats, guinea pigs and chinchillas. Dimensions: 30 cm L x 23 cm W x 21 cm H (11.8" x 9" x 8.3"). Measures 11.8-inch length by 9-inch width by 8.3-inch height, For small pets only. Constructed by 100% heavy-duty oxford fabric, our product is built to last for a lifetime - its waterproof and scratch-proof quality will save your peace of mind! Forget about cleaning it all the time! "LOVE IT !!! Have a great road trip with my pups! Catches so much dirt, hammock style keeps them from falling on the floor and kept my car so clean!" HIPPIH Pet Seat Cover constructed by oxford fabric and PP cotton mat keep a wide, comfortable and safe space for your dog. Easy to install and provides great coverage and protection for your car seats. Do not worry about dog hair or mud! Waterproof which is nice when it rains or take him/her to the beach. The Hippih 3-dimensional hammock is needed. - Catches so much dirt. 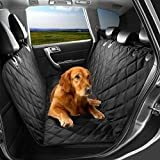 - Pet seat cover with side flaps, protect your car from scratches,especially the door of car. - 2 seat anchors to tuck in seat to keep cover from sliding. 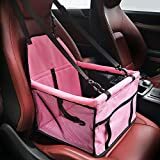 Protects your pet's safe when brake and swerve, meanwhile blocks your dog from trying to get in the front seat to distract your attention. - Adjustable fastener straps are Suitable for different vehicle rearseats.Perfect for your SUV & truck. How To Use: Simply snap the buckle straps around the backseat headrests and insert the seat anchors in between back seat cushions to hold it in place. How To Clean:Just using a damp cloth, vacuum to clean the stains or fur; It is washable, so you also could use a hose to rinse and air dry. Straps for secure fit. Adjustable safety leash included, Compatible with all harnesses. Easy to Install and Remove,collapsible for easy storage when not in use. Stylish abstract mesh sided design. Cool and breathable. Contain your pet to one area of the vehicle without restricting movement. Adds extra protection and security. Elevates your pet for outside visibility and comfort. Suitable for dogs and cats. Enhance you pet's travel experience with our booster seat! share your window view with your riding companion. Create a safe and happy driving experience. Defend your vehicle's upholstery and leather surfaces from pet hair, accidents, nail scratches, spills, and more with 'Arf Pets' dog Cargo liner. Our multipurpose nonslip shield provides wide coverage for your Car cargo whether you're traveling with a slobbery pooch or simply want extra protection against life's messes. Multiple layers of polyurethane material create an effective barrier against liquid, while the super-soft padded construction provides a calm, comfortable ride. The cover's anti-slip bottom keep it in place as even the largest, most rambunctious pups come along. Enjoy extra defense against crumbs, claws, potty accidents, and even injury with generous side flaps and two sturdy headrest clips. Our model includes specially an extra , so it's great for the entire family. No leaks, no stains, no dirt, no hair-just backseat doggy bliss! What You Get • 1 Arf Pets Pet cargo Liner • 2 Reinforced Headrest Straps • Pet safety, comfort, and clean peace of mind! Specs & Details • Measures 55" x 82" inches • High temperature rated anti-slip backing • 3 layers waterproof polyurethane • Soft padding • Adjustable headrest straps • colorfast material [won't stain] How to Enjoy • Place the liner on the cargo floor • Extra side flaps on both sides of the liner .Secure headrest straps • Let kids or pets enjoy comfy ride • Vacuum, wipe, or wash liner. • Keep car safe and clean! 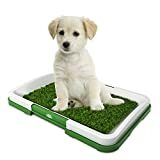 PRODUCT DETAILS: Materials: Synthetic Plastic (Grass Mat) and Hard Plastic (Tray and Insert) Dimensions: 18.3" x 13.3" x 2.125"
Our premium heavy duty material prevents damage from claws, dirt, wet dogs, water, sand, mud, accidents and slobber. The pets seat cover is quilted for a classy look and feel that will blend seamlessly with your vehicle's interior. Feel the difference of our cover's high end signature material in your hands when compared to others. Our cover's dual seat anchors and heavy duty non-slip rubber back secure your cover down so that it does not move. Wipe off drool effortlessly and vacuum hair easily with no need to remove the cover from the car or for large messes the cover can be thrown in the laundry machine. Install takes less than 30 seconds thanks to the quick release head rest buckles. Children and baby car seats are fully supported thanks to our velcro closable seat belt openings. This dog car hammock is 100% waterproof and protects your car seat from pet hair, mud and water. The nonslip soft rubber backing and multiple secure straps keep the pet seat cover in place even on leather seats. 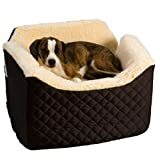 TOP QUALITY DURABLE MATERIAL: heavy-weighted 4-layer design in water-resistant oxford fabric, soft cotton layer, 100% waterproof polyester, and grippy loop PVC material to offer Best Quality Durable seating for your pets and your car. KEEP YOUR UPHOLSTERY CLEAN: protecting your leather seat perfectly from water, drink, spill, milk moisture etc. Retaining its shape and provides enough thick resistance against dog's nails/paws. WATERPROOF, EASY TO CLEAN & MACHINE WASHABLE: Protects your car back seat from all stains and mud and can be machine-washed. You can even clean it between trips without having to remove it - simply wipe it down with a wet cloth and let it dry. EASY TO INSTALL: Very easy to install with quick release clips. Seat anchor can insert to the crevice to fasten the cover, 4 sets of adjustable plastic clips that attach around the headrest in the front and the back to fix cover firmly. 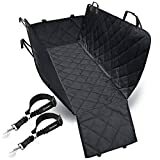 FITS ANY VEHICLE: 58 inch by 54 inch dog seat cover Heavy duty hammock convertible fits most cars, SUVs, minivans and trucks. Premium components FREE OF AZO Dyes.4 layers of PU waterproof durable material protects your vehicle no more damage and PVC free safe for your pets.Not only for small medium dogs, but also large breeds, kids, human.